The Oak and Pine Warehouse is dedicated to providing beautiful, quality hand made furniture for the home. We offer a large range of furniture at very high standards, all at an affordable price, and with our ethos of "Quality First", you will not be disappointed! 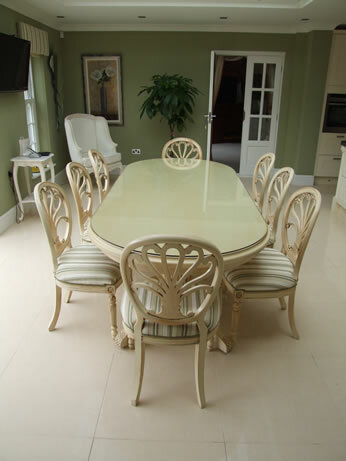 We, unlike most furniture outlets make the majority of the furniture we sell in the UK itself. This enables us to give you, the customer, the choice and flexibility on choosing precisely what you want including the sizes, styles, colours and even the handles of your choice. We also have our own in house cabinetmakers who can make your designs reality; saving you time on looking everywhere for that illusive piece of furniture! We can also make bespoke kitchens and other joinery projects exactly to your requirements. Our Showroom and workshop is based in Essex and is only ten minutes from the Dartford crossing making us ideally located for customers living in Essex, London and Kent to come visit! If you are unable to find exactly what you are looking for, we offer a bespoke service from our in house furniture making team so that you can design the furniture yourself. Please contact us for details or use are bespoke ordering form.